When I started to focus on my jewelry business full-time, I struggled with calling myself a jeweler. For the longest time I felt like a fraud, pretending to be someone I so clearly was not. With time I came to own own that title, as well as small business owner and blogger. But entrepreneur? No, that definitely was not me. Entrepreneurs do really big things. They are known and admired and are experts in their field. Me? I’m just a small-time creative business owner, trying to find my way in the crazy world of the self-employed. 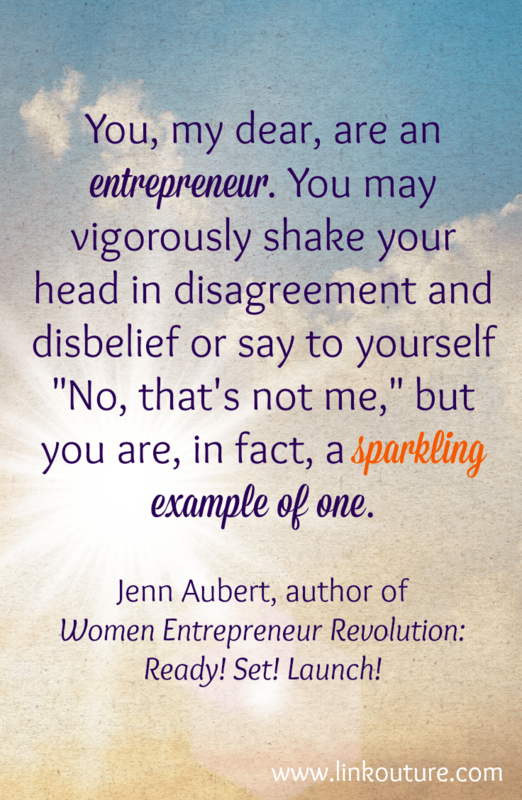 When I read this quote by Jenn Aubert in her book Women Entrepreneur Revolution: Ready, Set, Launch, I started to question my own beliefs about what it means to be an entrepreneur. The more I thought about it, the more I realized I am an entrepreneur. I may only be known by a handful of people for my jewelry and I may be admired by even fewer, and I may not be an exactly expert when it comes to running a business, but I started a business from the ground up. A business that I can call my own. Every day I am hustling my behind, trying to make it work, while I simultaneously take care of my infant daughter. I might not always succeed in accomplishing everything I set out to do, but I’m working each and every day to grow my business. If that doesn’t make me an entrepreneur, than I don’t know what does. Clearly Jenn saw a common thread among many women when she set out to write this book. A small business owner/entrepreneur herself, she interviewed over 100 women to both inspire and provide guidance to the many women out there who are or want to be entrepreneurs, regardless of whether or not they defines themselves as such. I am honored to have her here today to talk a little bit more about her wonderful book, role models, and what she learned from the experience of writing a book. First, I have to say I was very inspired by Women Entrepreneur Revolution: Ready! Set! Launch! Both by the book itself, and that you saw a need and set out to write a book to fill this need. Did you ever imagine you would write a book? I’m so thrilled you enjoyed it. Writing a book was always something I’ve dreamed of – like speaking fluent French and Italian, learning to play the piano or climbing Kilimanjaro. It was one item on a very long list. I knew I wanted to write a book but I had to find something I was incredibly passionate to write about. When I discovered exactly what I wanted to write on, it was easy to begin. It is still very surreal to see my name on a book. As you discuss, having role models is so important in succeeding as an entrepreneur. However, when asked, you mention that we often name these big-named women such as Sheryl Sandburg and Oprah as role models instead of looking to women with whom we actually have relationships, and additionally have elevated them to “hero-like status”. From where do you think this shift in who and how we look to for role models comes? Why do you think it is so hard for us to name women who, as you say, are “in our own backyard”? I think the media plays a significant role. How do we know about Oprah and Sheryl? They are everywhere we turn. The cool thing is there are more and more women that are being highlighted in the media so we are seeing more women – more examples of success. But we cannot only blame the media. Women need to step up more into the spotlight so that we know who they are and what cool things they are doing. Also at one point we elevated the concept of role models to a level where only a hand full of people can qualify. They have to be exceptional in every area of their life and usually have a rags to riches story. But I believe there are people everywhere we can learn from. Women in our communities, women who are in our industries just a few steps ahead of us and women out in the world who are doing remarkable work. We just need to make the effort to look for them because they’re out there. We don’t need to find everything in one person. We can have a whole “stable” of role models to learn from and be inspired by. At this point I have a long list of people I look towards for inspiration and guidance. The ones that are standing out right now for me is Alexis Maybank of Gilt Groupe and Jessica Herrin of Stella & Dot. Both have built significant companies while being moms to young kids. When hearing them speak they talk about taking time for exercise and family. I love that they strive to find some semblance of balance or integration. I also think Gabby Bernstein is fun to watch. She is really blazing her own path as a spiritual leader to young women – mixing business and spirituality. I enjoyed speaking with Anya Fernald of Belcampo. She has big bold dreams for creating truly sustainable meat production. She has ranches and stores in Northern California and an eco lodge in Central America. Her unapologetic boldness in how she wants to completely change an industry was really cool to hear. You include all these wonderful exercises throughout the book, from really thinking about the “why” behind our work to setting up daily rituals. How have writing these exercises influenced you and the work that you do? Is there anything you do differently since before you wrote the book? The exercises I’ve included were all based on tips and methods I’ve accumulated through the years of being a self-improvement junkie. I wanted women to not just be inspired by the insights and stories of these women but then to do something about it. I’m big on taking action so that’s why I included excavation questions and action items at the end in each section. I want women to take what they learn, dive deep into themselves and then go out in the world and do whatever lights them up. Since writing the book I’ve had a huge boost in self-confidence and a deep knowingness that I’m on the right path. I’ve been flirting with many business ideas over the last several years but taking the year off to just listen and absorb the wisdom of others has set me on a path that really feels right. I finally stopped pushing, trying and struggling and just sat back and listened to my heart. Big shift! One of the things that you talked about that really hit home for me was the importance of having a tribe that supports you. As a creative business owner, I have written about finding my tribe with a group of local artists/artisans. Additionally, I have an incredible virtual tribe of fellow bloggers who are constantly cheering me on. Who are some of the key people who comprise your tribe? I seriously couldn’t be doing what I’m doing without my tribe. Through the years I have met incredible women business owners and we are each other’s biggest fans. We share in each other’s successes, we coach one another, and we support and provide tough love when needed. We’re in constant communication. We have vastly different businesses which makes it fun to share ideas and brainstorm solutions. Few people understand the mind, as well as the ups and downs, of being an entrepreneur. It can look a bit crazy from the outside so it’s super important to find others who get you. I often do interviews on my blog, and I have to ask you one of my favorite questions: What is something people might not know about you? One thing most people are surprised to discovered is that I played rugby my first two years in college. I would have kept it up but I transferred to a different college that didn’t offer it. I’m sure my body is thankful for that. What was your favorite part about writing a book? What was your biggest takeaway from the experience? The entire writing process was amazing – from interviewing the women to figuring out the common themes to the actual writing. It was some of the hardest yet rewarding work I’ve ever done. My biggest takeaway is that whatever you can imagine for your life you can make it possible. You just need to clean up your mental chatter, take consistent action and maintain a strong belief in yourself. 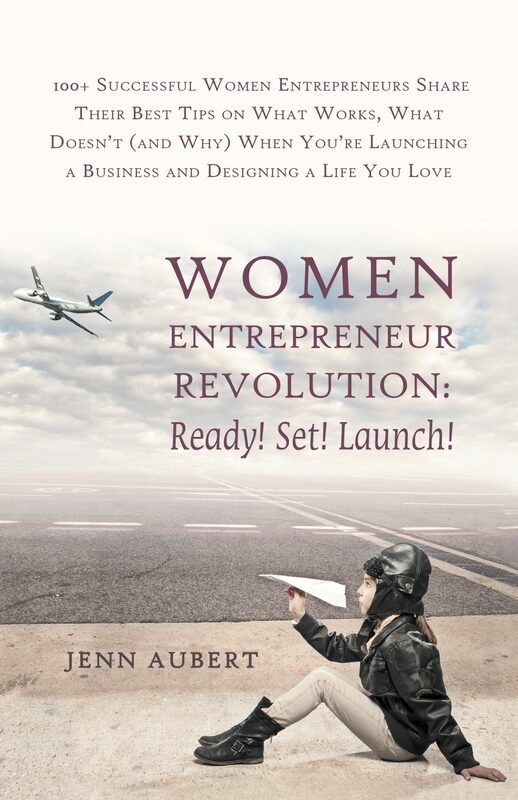 Jenn Aubert is an author and entrepreneur. Her first book Women Entrepreneur Revolution: Ready! Set! Launch! (Balboa Press, 2014) explores the mindset, motivation and behaviors of successful female entrepreneurs and the role models in their lives who have influenced them. Entrepreneur is such a loaded word. Its easy to jump to people like Richard Branson and Mark Zuckerberg or imagine hoody-wearing 20-somethings piled around a computer. But it isn’t limited to that. Look at all the amazing social entrepreneurs out there starting companies and the many solo-businesses (bloggers, coaches, jewelry makers, etc) impacting lives. It’s much broader than most people believe. And the word is very empowering once you adopt it for yourself… it can really change everything! I definitely agree that “entrepreneur” is such a loaded word, and hearing it certainly paints a certain image in mind (i.e. not me!). There are so many of us that need to learn to embrace it! I love this!! I don’t know why we women tend to “down think” things we do. We’re “just blogging” or “just making jewelry” instead of owning awesomeness of the things we do!! Isn’t it crazy? I hear it all the time. “I’m just (fill in the blank)” Always downplaying how amazing they are. We need to be proud of our accomplishments no matter how seemingly small they are. I want women to celebrate the fact that they have made the huge step to start something entirely from scratch. That alone is significant and more than most people will ever do! Celebrate and be proud! I was SOOOO guilty (and still am, but not as much) about “down thinking,” especially when I first started doing this full-t,e. But how many people in my life can say they took a risk by starting something from the ground up? Probably just a few. And I really liked what Jenn said as well, I was thisclose to making it into an image. Oh, thanks so much, Crystal, I really appreciate that! And I am so glad to be a part of this, thanks for allowing me the opportunity. My pleasure, Jenn! Thanks for writing such an empowering book. I haven’t read the book yet but it totally speaks to me as an entrepreneur! Or maybe a wannabe one. I feel like maybe it’s in me but I’ve been so scared for a long time. And this interview is awesome! I down think nearly everything I do. You are definitely an entrepreneur, Tamara! Let’s all embrace it. And try to make a pact to not down think the awesome things we do. Loved this book! I struggled calling myself a writer for a long time. Now, when people ask what I do, I say I’m a writer and entrepreneur. More women need to read this book. We need to support each other and help each other grow. I could go on and on…. I could not agree more! I think this plays into so well what Jenn said about the importance of a tribe. I know with the support of you and all the wonderful bloggers in my life it has helped me to feel more confident in calling myself a blogger. Really want to read this book now! It took me so long to call myself a writer. I have finally just started to do it with pride and confidence.